I’m simultaneously excited and exhausted. Excited because I’m finally making my big announcement in this blog (give me a minute) and exhausted because- the cold I caught in April turned into something resistant to amoxicillin- and then became pneumonia. Ok, but now for the big news…. We are building a new place! After selling our home, indoor and barn back in 2014 and ‘wandering’ for the last two years we have bought land and we are settling down again. And building everything from scratch. Years ago, when we lived in Mount Gilead, if we wanted to go trail riding we would haul our horses to Mohican State Park for the day. Some of you who attended clinics at our place will remember the group of us hauling up to Mohican on the last day of our clinics. We have loved riding there for years. For fun Jesse and I would drive around the outskirts of the state park land dreaming of living near the trails. Once when we were riding at the park we noticed a group of people riding who had obviously paid to ride for the day (the sneakers, shorts, and guide gave them away) and we followed them home. On the back side of the park was a horse property that gave guided trail rides on the park. “Wouldn’t that be an amazing location?” we said. But we were newly married, had small children had just bought our first house and were totally broke. But a couple can dream, right? Over the years we still rode at the park. Just a couple years after discovering this horse rental property it went up for sale. We were still broke. It sold. Life went on. But every time we were in the area we still drove by. Still dreamed. 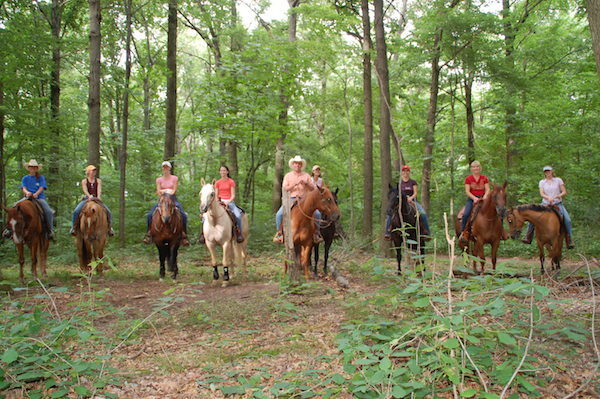 Last year before we flew to Germany we went on another trail ride at Mohican. You might remember watching the video that I posted. But this time things got a little more strange. The land that we wanted over a decade ago was now being offered to us. We didn’t even have to talk about it. Yes! We would love it! Some people might call it a coincidence but I call it a God-incidence. What are our plans? Build a large indoor, a house and rv hookups. Hold clinics again at our place where you’re invited to join us but this time, this time we won’t have to haul to the trails…we can just ride straight out onto them! I loved you Texas…but that few months we lived there has been ‘branded’ into peoples minds, lol! I’m still amazed at how this all worked out. Five years ago Jesse and I sold our house…with no plans on where we were going to live. We had three teenage boys eight horses (and a couple minis). The first place we went was Texas because a friend had just built a very large covered arena with an attached apartment. We left our house of 14 years on February 14, 2014. After a few months in Texas we moved into a motorhome and then traveled the country, homeschooling three teens, towing a horse trailer and blogging every day. It was quite an adventure! When we left Ohio we had no idea where we would end up. During our adventure we were heavily leaning toward Arizona or Colorado…but apparently God had other plans. 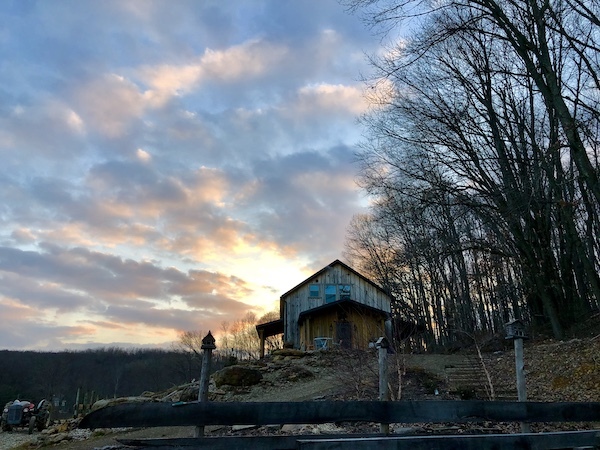 We live here in Ohio in our little cabin on a hill. 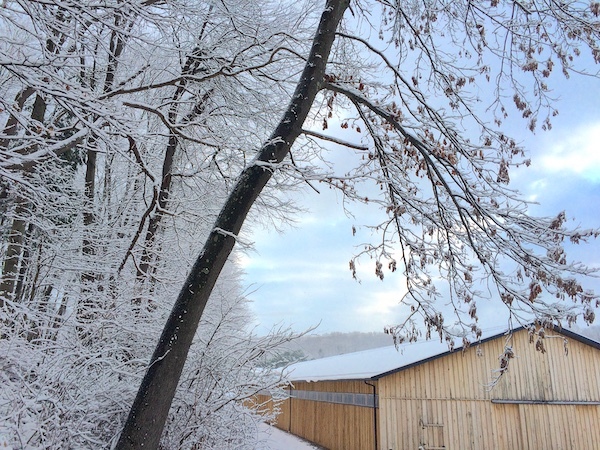 Our giant indoor & barn is a perfect contrast to the tiny cabin. Isn’t that funny! Life is what happens when we’re busy making plans! My husband is currently active duty military and we have been planning to retire in Idaho, as we’ve planned for 21 years! But, as with yours, God has other plans! Looks like we ARE moving to Texas! Now for us to find the property! Maybe you can come down in a few years for a weekend in our (hopefully) indoor! LOVE this!! That is such a God-thing! He gave me my first horse, my first job as a riding instructor, and many other things perfectly down to the minute. Now we’re in the place of trusting Him for our first place… So this was an exciting and encouraging read! Awesome!! And Sue and I still have a visit to you on the bucket list! Your place was definitely God’s design! Stacey. 50 yr ‘Amish mechanic’ in Huntertown 69Purdue with an access to a Puffer Belly Rails to Trails project in Allen County. A developer. My clients build million $ homes. Want to age in place with my wife & a horse on this proposed ped/eq/bic trail to Pokegan State Park. Ch 39 proposed a May 1 6:30 presentation and I would log ke to us your material to promote this concept. Been working my dream & doing needs to be & is now happening. Thank you for being a inspiration to my life. I’m so happy for you & Jess. Waiting while God works things out is sometimes hard or just plain puzzling but there you are after meeting Carlee and you have your dream! You and I talked about this at the last Horse Fair in Montgomery Alabama. I shared how we almost didn’t come and how the crowds dwindled each year but we came because you were there. You lifted us up as you spoke and rode and it was definitely a God thing. My husband is facing a knee replacement in September and then I have to get him moving and back on his horse. Sometime next year we are going to join you on one of those rides in Ohio. It’s a plan & I look forward to it! I can’t wait for a clinic! I want that connection with my horse and the further horses I train. After watching your video time after time I am convinced your relationship is much stronger than mine. I want to learn how to develop that! So happy for you on the land purchase!!! Wonderful spot and sounds perfect to me too!! Congrats Stacy! I confess that I had to look up what part of the country you’ll call home. I’ve never traveled to Ohio. Let me know when you want me to write about your new facility for equestrians on the Writing Horseback blog. Outstanding! I vote for God-Incidence as well. Looking forward to coming to another clinic and taking a trail ride at the park. So very happy for you and your family. You guys are great!!!! You guys really are living the dream! I’m so happy for you and your family. I would love to come to one of your clinics and ride the trails! Just have to get there from Canada:) I hope you are feeling better and getting some rest. How exciting! I’m so happy for you, Stacy! You’re living my dream! That’s awesome what a great location!My favorite place to ride! How wonderful! I hope when you’re settled you’ll post an event schedule! Stacy and Jessie i am beyond excited that your back. What a wonderful story…everything in God’s time. I am looking forward to attending your clinics!!!! now how cool is that? He had it under control all along:). Happy for you Stacy. Excellent to hear! I wondered if Ohio would pull you back. Neat story and glad for you all. Welcome back! Have to love a God-incident when you recognize it!!! Blessing on your return to Ohio. Once a Buckeye, always a Buckeye. Love when you post ! How amazing for you and your family. A dream come true. It is so beautiful there. Look forward to hearing of more adventures? Yeah, could not be happier you’re coming home !! Have always wanted to meet you ! Now I may have to buy a horse to make that happen ! Congratulations on buying your “dream” property, God is watching over you ! HE/God has a plan ! ? welcome back to Ohio glad to have you back home! Your mama must be so happy! Get well soon. Settle down, settle in & enjoy the good life. Love to hear about your life & family. Congratulations! That is very exciting for you and all who follow you. I recently moved from California to east Texas where I could have my own piece of paradise…it only took 50 years:) I went from a boarding stable (with 250 horses and mostly weekend riders…ugh) to 15 acres in the country with my very own arena and barn!!!! So happy for you guys! I bet you are still happy dancing. 😀 Hope to visit one day! I’m happy for you!! Congratulations!? Does this mean you’ll be at Quarter Horse Congress this year. ?